Preseason training sessions are universally dreaded by footballers, but moral at Arsenal’s London Colney base seemed high this week. The photo below, which was posted on Arsenal’s Instagram account on Saturday morning, encapsulates a playful mood. Joel Campbell has been told to look for a new club by Arsene Wenger, according to the Daily Star, but the Costa Rica star seemed happy enough, despite being wrestled by Gabriel Paulista. Gabriel has filled in well for Laurent Koscielny and Per Mertesacker since arriving at the Emirates Stadium in January 2015. The Brazilian centre-back has started 29 games in all competitions, impressing with his composure on the ball, as well as his two main assets – his positional awareness and his pace. 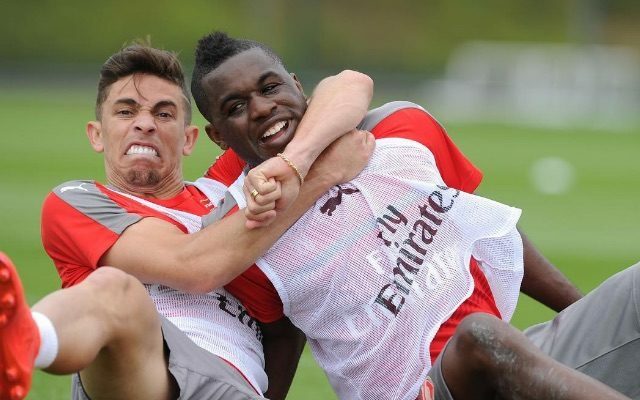 However, as this photo proves, Gabriel is also an exceptional gurner.